Summary: With the local vampire coven decimated, Julia and Nicholas try to begin a somewhat normal life together. 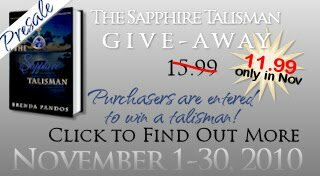 Bound by secrecy from a shape shifter determined to see Julia’s world-saving prediction come to fruition, Julia isn’t allowed to tell Nicholas the leader survived, ransacking her happiness with guilt. When Alora returns, bent on revenge, the reunion forces Nicholas and Julia to choose what they are willing to live and die for. 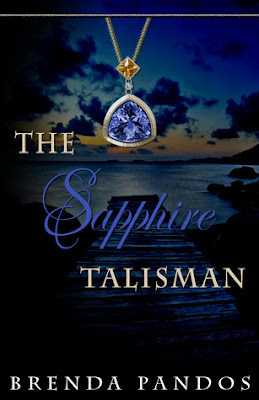 My Review: The Sapphire Talisman was an enticing and compelling follow up to The Emerald Talisman. Brenda's flow of writing has developed since the first book. Her artistic potential and storytelling skills succeeded in formulating a wondrous continuation. The unexpected plot twists and defined characters helped me once again get lost in Brenda's creativity. This time around, Nicholas and Julia switched roles. Instead of Nicholas protecting her, Julia turned into a feisty and courageous young lady. In the hands of Alora, a malevolent vampire, Nicholas succumbed to his half vampire darkness, leaving Julia to fend for herself. However, before evil fell upon him, Nicholas had a heart fluttering likability that I felt lacked in the past. The relationship between the two blossomed into a sweet and tight bond. I must say though, I was amused by his change and actually preferred the evil version better. Then again, I am biased since one of my favorite characters abruptly came back. Due to spoilers, I won't mention his name. The only thing I will share is that this certain individual tickled me with butterflies. His cocoon of love for Julia made me swoon like a little school girl. He had the perfect balance that all vampires should embody, and did I mention I am in love with him? Moving on, throughout the fight for Nicholas's freedom, Julia's ability to sense emotions and auras came in handy. I was glad to see that she no longer acted naive and actually functioned without being around him. All in all, the sequel surpassed my expectations and left me longing for the next installment. I am eager to know what lies in store for Julia and Nicholas. Will their relationship sustain the damaging cracks or will she maybe move on to someone else? Hm, we shall see, hopefully Brenda releases it soon! I also wanted to share with you the back cover which I think is breathtaking -- definitely captured Alora's attitude to a T! 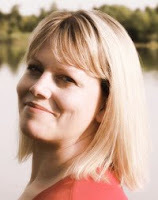 Brenda Pandos is a web-designer who lives in California with her husband and two energetic children. Shortly after the birth of her second son, Brenda's oldest was diagnosed with an autism spectrum disorder that turned her world upside-down. Her life became round the clock feedings with a newborn and a daily stream of tutors working to help her son. She craved a meaningful escape. 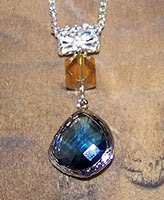 The main concepts of THE EMERALD TALISMAN came to her in the wee hours of the morning as she reminisced the good old days when she lived with her best friend in the Santa Cruz Mountains. As a young girl, Brenda was a hopeless romantic, constantly lost in a fantasy world in her backyard of knights on white horses, mermaids and evil villains. As a teen, shows such as Buffy the Vampire Slayer, Angel and Interview with a Vampire intrigued her. With the encouragement of a friend after writing one chapter, she continued on to complete her first manuscript. 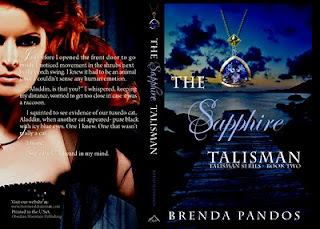 THE EMERALD TALISMAN is a compilation of what the author would like to happen if she ever happened to encounter a real vampire. Go HERE to place your order now! Oo and Ahhh's. This looks good. 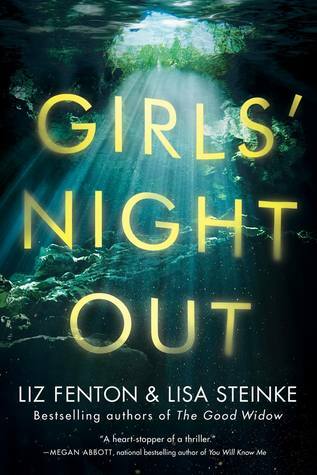 Great review and I need to read this book. I have actually met her and so waiting for this next book too.